An exciting time of year for me as I scour the skies and listen out for the scream of the swifts as they return to London. They stay until the end of August. If you click the RSPB Swift page on their website you can hear the sound they make, as well as all about where they come from to get here. You know the summer is really here, when they arrive! They have a strange habit of arriving in the day of the F.A. football cup final which is usually the second weekend in May, but a couple of times I have seen them during the last week of April. It is a magical moment when you hear the first scream in the sky and see one skimming past you. For the first few weeks they are here, the noise is amazing! Then you get used to them being around and then one day in late August you suddenly notice you cannot hear them anymore and they left without saying goodbye, and the summer is officially on its way into Autumn. So if you are in the UK, particularly in London, keep you ears and eyes peeled. I always spot one first as I have ears like a hawk, and Mr P. is annoyed as he works outside all day. But hey ho! So one day soon, I shall be jumping up and down! Yey the swifts have arrived! -violin. Frida Bauer – piano. The swifts arrived in my corner of the world about 10 days ago. Only the other day Mr DV and I were having a long and heated discussion about whether they were swallows or swifts (the conclusion was that we think we have both), and what they were called in French. 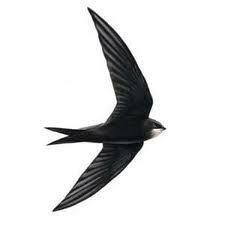 Thanks for the link to the RSPB site – hearing their song has confirmed that some of them are definitely swifts!